I don’t know about you guys, but I’m kinda over shopping at the moment. Gasp. I know. A fashion blogger that doesn’t want to talk about shopping? The irony is just too rich there to touch. But let’s back up a minute. It’s not that I’m necessarily over shopping. I still love finding great deals at some of my favorite vintage shops in the village. And I’ll happily wait in line for some of my go-to brands’ sample sales. But I suppose if I have to hear the phrase “You NEED this item from *insert department store name here* anniversary sale,” I might have to throw my already outdated iPhone 7 plus out the window. It’s all becoming a little much, don’t we think? Now, I could go into all the reasons why I’m not posting about the Nordstrom Anniversary Sale, but alas, Dana already saved me the trouble and I just couldn’t say it any better myself, so that settles that. Instead, I’d love to share my new and not-so-well kept secret, which has been the perfect noncommittal way to itch that shopping itch, without guilt: Rent the Runway Unlimited. If you’re familiar with their one-off rental service, it’s quite similar in nature: for $159 a month, you can choose up to 4 different pieces at a time, with no set return date and you can rent as many times as you like throughout the month. Once you return a piece (either via the provided UPS labels or if you happen to live in NYC, you can drop off in person at the flagship on 15th), a spot opens up in your rotation, ready for you to pick a new item. Seems pretty straightforward (and kinda dangerous), right? 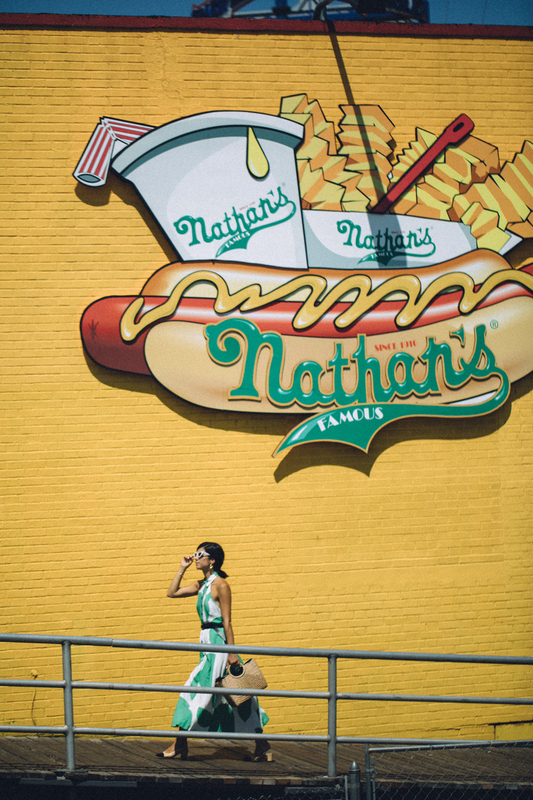 Naturally, when their team approached me about trying out the service, I was excited to dig in, but of course had a few hesitations and doubts as well. It’s now officially 2 months into my membership, and I gotta say, we’re going pretty strong, except for a few little feature requests I have (because, hey, no relationship is perfect, am I right?). For context, this post isn’t sponsored, but the Rent the Runway team did comp my membership for the first month so I could try out the service. As always, I just wanted to share my honest thoughts here with you today! The inventory: I’ll fully admit, my first hesitation was around what kind of pieces they have available to rent. As someone who has used their service many times for one off black tie events (and loved the experience, mind you), I was a bit nervous that I’d have an overwhelming amount of evening dresses to choose from and not enough ready to wear, daytime pieces. Great way to test drive new-to-me designers: Saloni has been on my radar for a while now, but I just hadn’t pulled the trigger on any of their pieces just yet, mainly because I wanted to be sure I would be happy with the quality and fit for a contemporary designer price point ($500 + for a dress). Of course, once I saw a handful of Saloni dresses as part of the RTR Unlimited offering, I couldn’t add to cart fast enough. 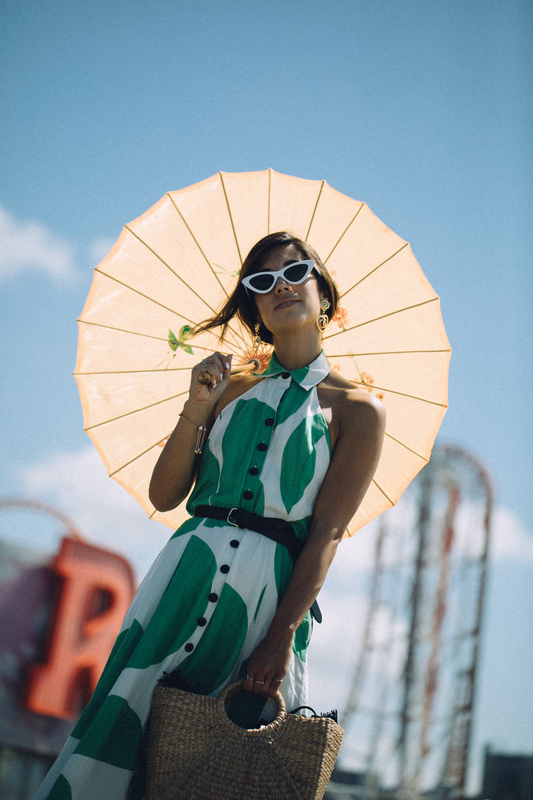 Not only was I ultimately happy with Saloni (and proceeded to rent pretty much every last Saloni dress on site), I loved the fact I was able to do a little bit of market research before hunkering down to purchase one. The cost efficiency of the program is mind boggling: Let’s just do some simple number crunching here. 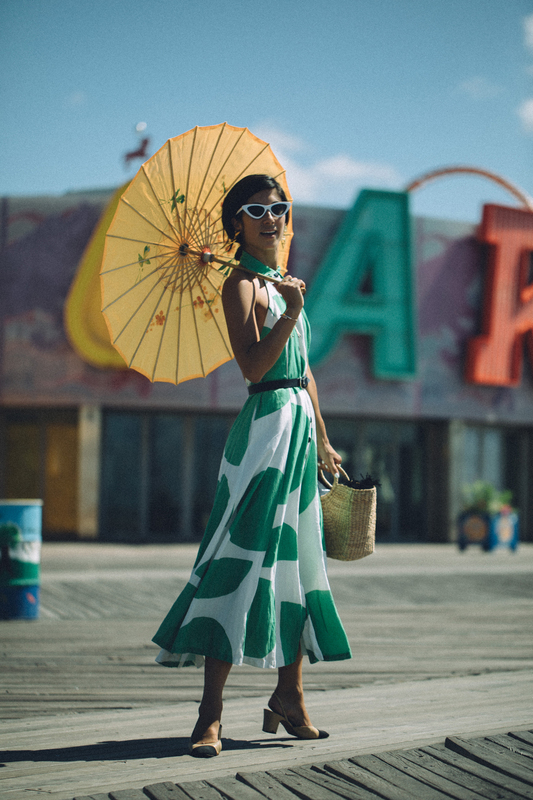 Over the course of roughly 2 months, I rented 10 pieces, wearing each item multiple times for events or photo shoots that I had planned (like the Mara Hoffman dress you see here that I wore out at Coney Island!). The collective grand retail total for all of these items comes out to…drumroll please…$5,345. $5,345! For $159 a month, I was able to rent, wear and love some incredible pieces that would have set my bank account back by $5,345. As someone who is in the business of changing many times throughout the day for events and shoots, I definitely plan on using this service moving forward, especially for very seasonally specific dresses that I may not NEED in my closet longterm. And as someone who used to work in a very corporate environment, I can also see this service being amazing to build out your workwear wardrobe with zero $$$ commitment, thereby giving you more budget to buy some of those more fun pieces you’ve been eyeing! Rent to buy is easy and price tags are heavily discounted for members: Here’s where things might get dangerous: every piece available as part of the loan program has an exclusive price tag attached to it — many times discounted by 30 to 50% off regular retail — so once you find a piece you absolutely ADORE, pulling the trigger is that much easier and gentler on your wallet. Take this green Mara Hoffman dress here: I think I wore it 5 or 6 different times (not necessarily all day, but for different outings and events) and received SO many compliments and questions about it, that by the end I decided it needed to come home with me. A more eco-conscious approach to fashion: In an industry that encourages consumption season after season, it did feel pretty good knowing that I wasn’t necessarily adding to the cycle of overproduction. Every little bit counts, right? Availability: The unlimited rental time window for each piece, while great for seemingly fitting better into a real schedule, did make it a bit tricky when it came to ordering certain popular pieces. Case in point: there is a red polka dot Saloni dress that was unavailable in all sizes for all of the two months of my membership thus far and I imagine it’s because most people want to hang on to it when they receive it! Update: I just checked on site again this morning, and it’s still unavailable. There’s also a golden Christian Siriano gown that I was dying to rent, but same story: unavailable every time I checked and I was checking close to every morning. I wish there was a feature to notify me when a certain item is finally returned: Dear product development teams, if you could make a “notify me when…” feature, to essentially text/email me when one of my waitlisted items comes available back into the rotation, I would be FOREVER grateful. Sincerely, Krystal. Expansion of brands: Don’t get me wrong, I love the breadth they offer currently. 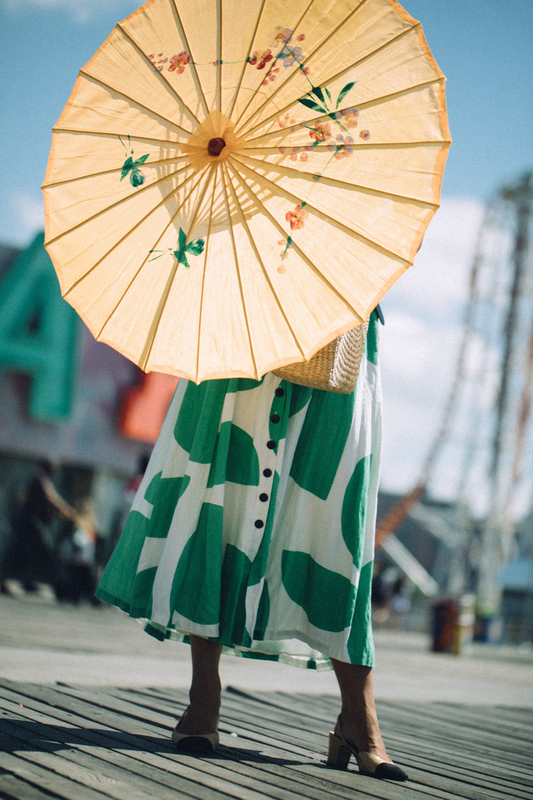 But I found myself praying, wishing and hoping for Zimmermann, Ulla Johnson, Jacquemus, Rosie Assoulin. I completely understand that this is more a business development point, and not necessarily a fault of the service, but if you’re reading this BD team, yours truly would be SO excited if you managed to sign some of these slightly higher tier designers on board. I’d probably be willing to even pay a bit more for that service, if that helps? And there you have it! But I’m dying to know — have you guys tried out Rent the Runway’s Unlimited membership? Would love to hear your thoughts! If you’re curious to try it out yourself, they are offering the first month of membership at a discounted $99, instead of the regular $159 per month. Simply use the code NEWCLOSET at checkout. This post was not sponsored by Rent the Runway. They did comp my first month of membership so I could review the process. All thoughts and opinions here are my own. 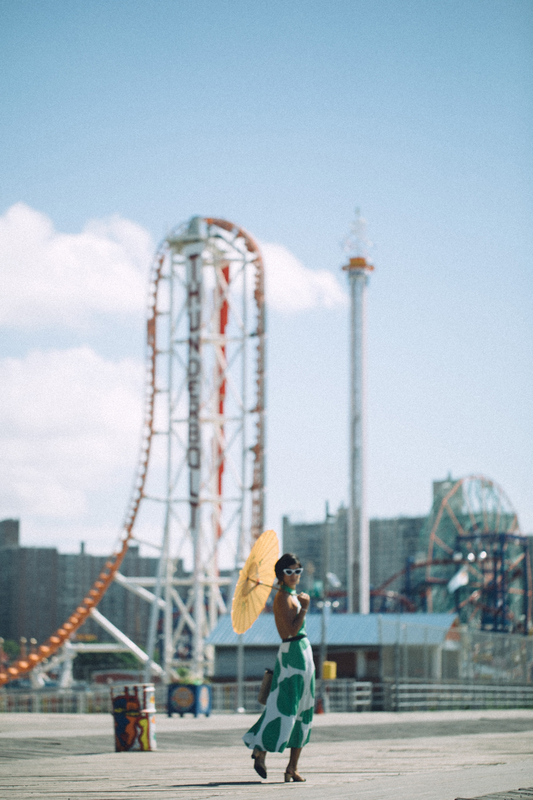 Style and coney island, new york, nyc, rent the runway, summer dresses, summer outfit, summer style. Oo I’m loving the RTR unlimited! And I’m loving the dresses you are wearing from them! I was curious about this service, and assumed they wouldn’t have brands I was interested in. Shame on me for not verifying. I really appreciate the review of the process and experience. Thanks for sharing my post, Krystal! We are SO on the same wavelength here! Really loved this post and appreciated your honesty here! As fashion blog readers, I think a common theme that perplexes us, is how frequently fashion bloggers have to buy new items! It seems like there is no budget; expensive items just appear and just feels like you can’t keep up with the Jones’! Of course I’m sure many items are gifted or borrowed, but still… It’s constant shopping shopping shopping! A new it bag, or it shoe.. as readers, its exhausting! Anyways – I couldn’t agree more that RTR NEEDS Zimmermann!!! I had a baby late last year and have had multiple weddings this year and instead of buying expensive gowns in larger sizes, I decided to RTR instead and I am so glad I did! I ended up renting the same Cinq a Sept gown 3 times in different colors bc.. obsessed! But wow if there was Zimmy at RTR, we would have a problem! haha 🙂 And this dress is SO adorable on you.. definitely a purchase!